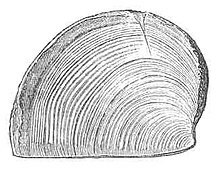 ^ Introduction to Ammonoidea. The Geology of Portsdown Hill. [2007-04-26]. （原始内容存档于2007-05-02）. ^ Walker, Cyril（英语：Cyril Walker (palaeontologist)）; Ward, David. Fossils. Smithsonian Handbooks revised, illustrated. Dorling Kindersley. 2002: 145. ISBN 0789489848. 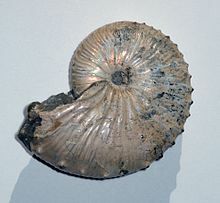 ^ 5.0 5.1 Wippich, M. G. E. Allocrioceras from the Cenomanian (mid-Cretaceous) of the Lebanon and its bearing on the palaeobiological interpretation of heteromorphic ammonites. Palaeontology. 2004, 47: 1093–1107. doi:10.1111/j.0031-0239.2004.00408.x. 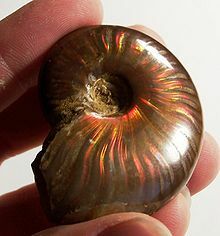 ^ Ammonites. 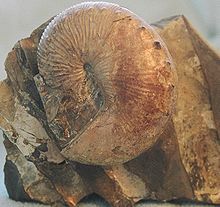 Hanman's Fossil Replicas and Minerals. （原始内容存档于2003-02-10）. 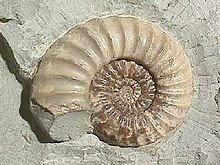 ^ Fossils: myths, mystery, and magic. The Independent. （原始内容存档于2007-11-11）.